CBS only added a couple of comedies to their 2014-2015 lineup, and the sole new half-hour sitcom to find a spot on the Fall lineup is The McCarthys, a multi-camera comedy that's been in the works for quite a while now, but looks like it may very well be worth the wait. Not only does the promising multi-camera comedy offer a great cast that includes Laurie Metcalf, Tyler Ritter, Jack McGee and Kelen Coleman, but there are some humorous moments in the preview, as we see Tyler Ritter's Ronny trying to distance himself from his family. THE McCARTHYS is a multi-camera comedy about a loud, sports-crazed Boston family whose somewhat athletically challenged son, Ronny (Tyler Ritter), is chosen by his father to be his assistant high school basketball coach, much to the surprise of his more qualified siblings. Ronny wants nothing more than to move away, join the singles scene and find a partner. His distraught mother, Marjorie (Laurie Metcalf), is not upset that her favorite son is gay, but that he wants to leave Boston and his family. Ronny's plans change, however, when his politically incorrect and outspoken father, Arthur (Jack McGee), stuns everyone with his choice for an assistant. Touched by his father’s offer, Ronny embarks on a completely different future – and he can be sure that his loving, tight-knit family is going to have a very vocal opinion about it. Jimmy Dunn, Joey McIntyre and Kelen Coleman also star. 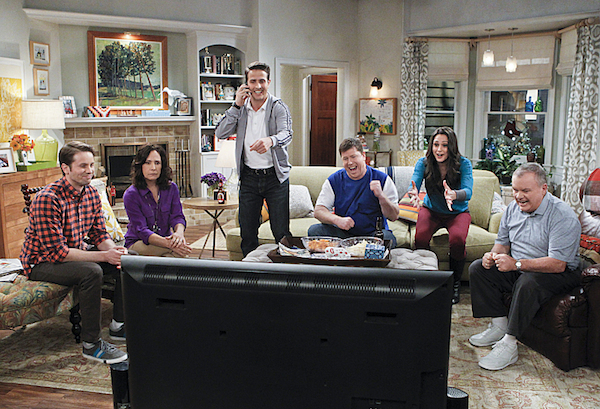 CBS's multi-camera comedy The McCarthys has been in the works at the Eye for well over a year now. Originally, the comedy was going to star The Office's Jake Lacy, but by Summer of last year, the pilot was being sent back to the drawing board to be retooled. In the end, Lacy was out and Tyler Ritter -- son of John Ritter, brother of Jason -- stepped in to play Ronny. Now it seems CBS is ready to move forward with it. They have it set up to air after Two and a Half Men on Thursday nights, starting this fall. It'll cap off the network's two-hour comedy block, airing ahead of returning drama Elementary. View CBS's full 2014-2015 lineup here.